Graphite transfer sheets also feature prominently in Widjaja’s new works for Imaginary homeland. Continuing his research into the image negative, the artist uses large carbon sheets to trace and transfer wuxia (martial arts) film stills. Wuxia film is a form of Chinese diasporic cinema that the artist grew up watching in the 1980s. Widjaja’s frame-by-frame contemplation of major combat scenes is expressed in the 10m long installation Imaginary homeland: kang ouw (二).¹ Each side of the canvas carries a riven part of the image duality. Alongside wuxia, ancient Javanese poem hana caraka is a significant conceptual influence in the work. The mythical origin of the Javanese script, the poem consists of four short lines, and is a perfect pangram of the Javanese alphabet as each letter appears once. It tells of two warriors who duelled till death. 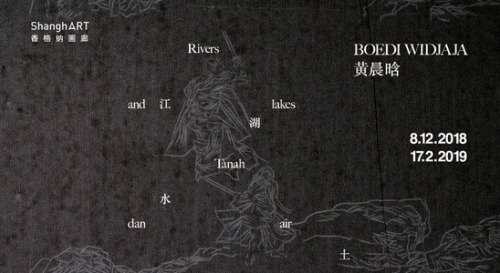 The heart of the exhibition, ‘live art’ and textual work Rivers and lakes Tanah dan air², echoes hana caraka. The artist wrote a bilingual poem of four lines, “Rivers and lakes / Tanah dan air / Land and water / Sungai sejarah”, which were re-ordered in 24 permutations, creating 24 poems. Each line, consisting of geographical features and elements, contains multiple cultural associations. The artist recorded the voice of his father reading the 24 versions of the poem. His father also wrote the text that he read. Across several days during the exhibition, the artist will shuffle a playlist of the 24 voice recordings and broadcast his father’s reading. Widjaja will listen and trace his father’s writing using a transfer sheet, eventually covering the blank 9m wall with this repeated text-as-image. ²“Rivers and lakes” is a literal translation of kang ouw. And while “tanah dan air” means “land and water” in Bahasa Indonesia, the composite “tanah air” means “homeland”.